Marco Fu set up a final against Ronnie O'Sullivan of the Royal London Watches Grand Prix in Aberdeen after battling to a late-night win over Gerard Greene. The world number 27 finally won 6-5 in a match lasting four hours and now takes on O'Sullivan, who came from 5-2 down to beat Shaun Murphy 6-5. It is Fu's first ranking final since the Grand Prix in 1998. "I'm very happy to be in the final. 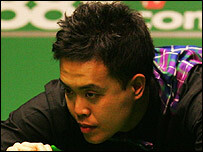 It was a real struggle to get over the line," said Fu, who had trailed 4-3. His recovery saw him move to within one frame of victory with a 5-4 lead but Greene snatched the 10th frame on the black to set up a decider. Greene looked set for victory when Fu missed an easy pink but the Kent-based Northern Ireland international failed to capitalise and missed out on the final. Fu, who made breaks of 73 and 106, added: "I'm very disappointed with that performance. "I wasn't nervous, but I was very tired towards the end of the match. I feel terrible after that match, I didn't play well. "It's frustrating because nine years is a long time to reach a second ranking final. Today I struggled. "I've been to semi-finals since then, but that doesn't mean anything. Mentally I've not been strong enough, but hopefully I can out that right in this year's final." Murphy was dominant early on with breaks of 138 and 108 helping him to build up a comfortable advantage. But O'Sullivan came to life to run off breaks of 75, 72 and two 62s to claim victory. "I felt the tension out there in a situation like that - you wouldn't be human if you didn't feel like that," said O'Sullivan. "It's good to come back like that. I didn't think I could - but I kept plugging away. "I just felt tension from the off. It was a strange kind of game; I've done well to win it in the end." Murphy was left disappointed after missing out on the chance to leave himself in contention to win his third ranking title. "I was in a very strong position at 5-2 - but I've played and watched enough snooker to know that someone of Ronnie's class needs putting away," he said. "If I'm being ultra-critical, which you have to be to improve, I played the wrong shot in the last frame - which turned out to be my last shot. "But when you've seen your lead disappear through no fault of your own, you start to think that you're going to have to make it happen. "We matched each other shot for shot, and the match opened up. I made two centuries; he made some great breaks - it's a shame there had to be a loser."